Who knew that December was such an eggy month? I certainly didn’t. Since there were so many sweets this month, M,G, and I decided to split them evenly. And somehow I ended up with the Orange Cream Pavlova (8 eggs), the Chocolate Soufflé (4 eggs), and the Tangerine Cake with Citrus Glaze (6 eggs). Okay, so that’s only 1.5 dozen, but you have to admit those are some egg heavy desserts. Let’s get started. 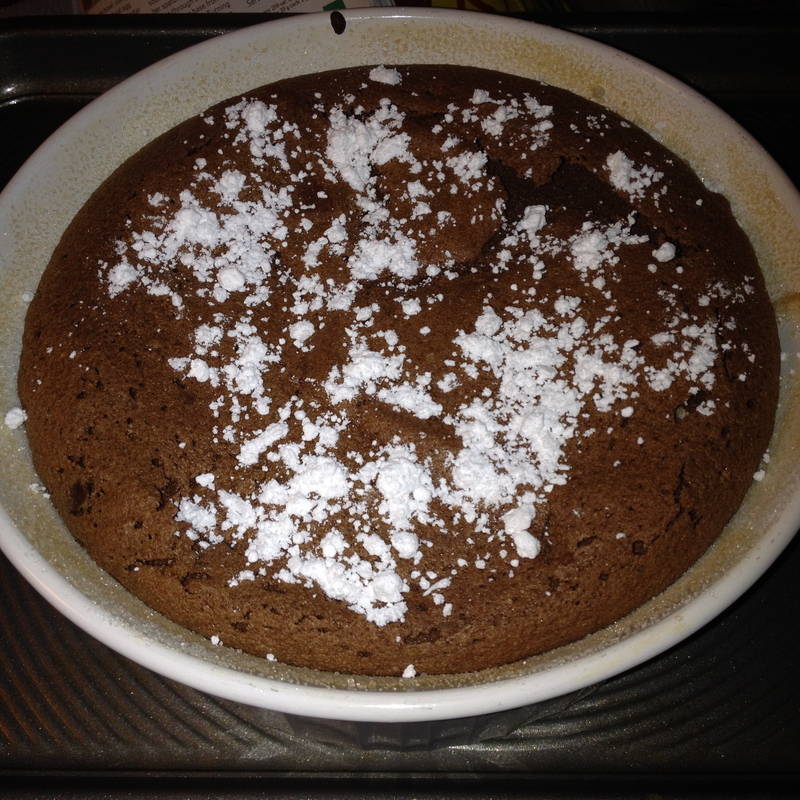 I decided to make the Chocolate Soufflé at my mom’s house over the holidays, almost entirely because she actually had a soufflé dish, but also partly because it’s better to share supremely decadent desserts right? I may have made one (minor?) mistake with this recipe. 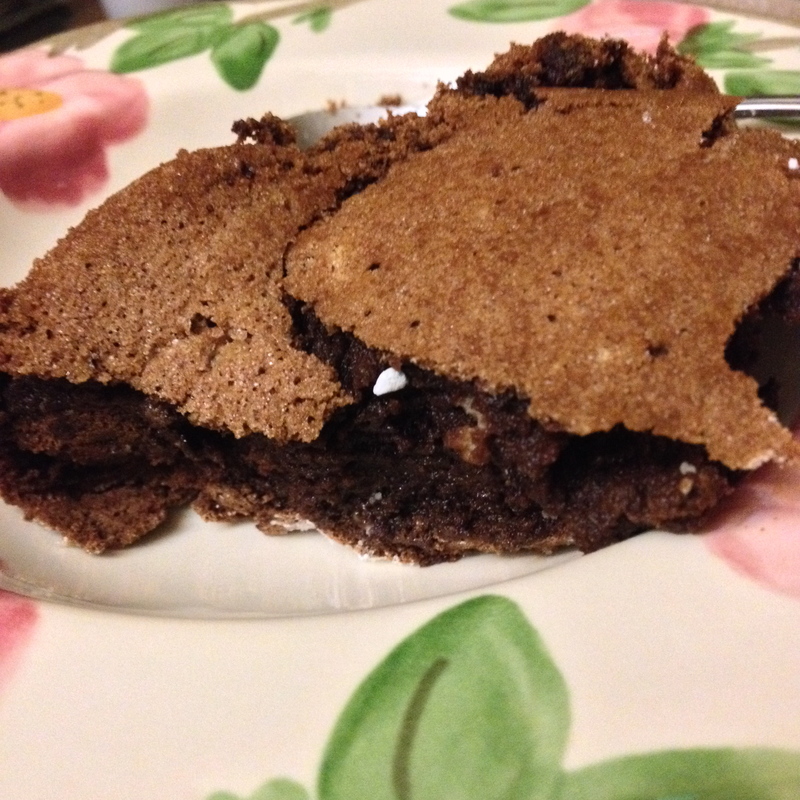 Instead of whipping the sugar with the egg whites, I may have melted it with the chocolate… (I also may have had a few drinks before making this). As a result, I think the texture was very slightly grainy, which I don’t think it would have been if I had done it right. Oh well. The sugar coating the dish made a nice crust on the outside of the soufflé so it was really easy to pull out 4 servings and not losing a ton of chocolatey goodness to the dish. Looking back, I might recommend eating this with a side of ice cream just for the warm/cold contrast. The outcome is basically like eating super rich, deeply chocolate fluff. All you tastes is chocolate. In a good way. It’s not exactly creamy, but its not exactly caky either. It’s enjoyable. And its really, really, really chocolatey. It’s a holiday win! 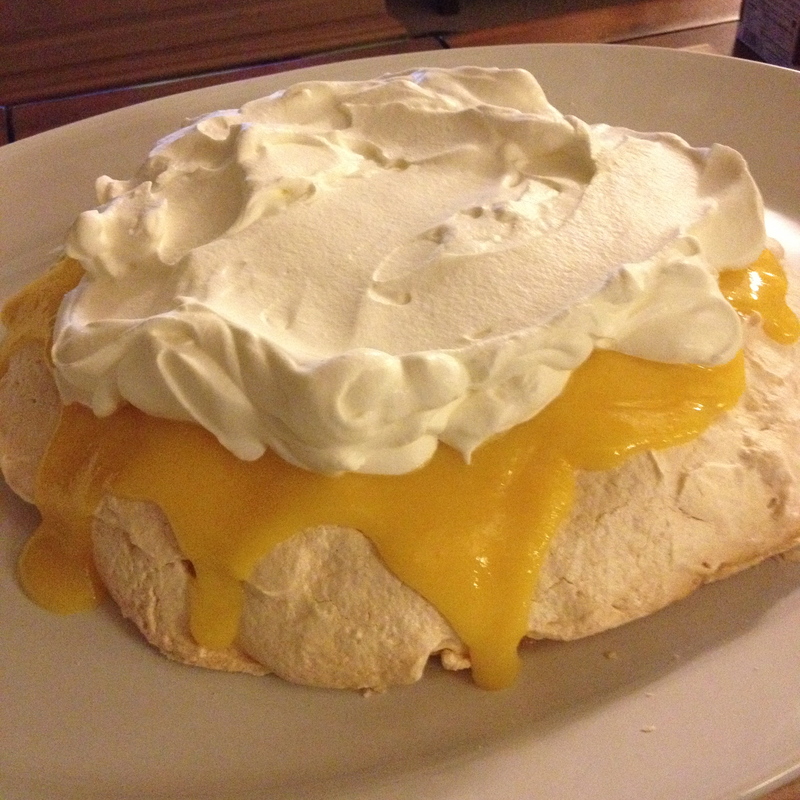 My next venture into whipping egg whites was the Orange Cream Pavlova. I managed to make this one while completely sober, so I added the sugar at the appropriate time. This was so thick I had a really hard time molding it into a circle. This lazy girl didn’t bother drawing the circle on the parchment and I think I managed a pretty decent circle on my own. If I had been entertaining with it (which I totally should have been) I might have made the effort, but I really don’t think it would make a huge difference. Word of warning, baking meringues is a little bit tricky. The magazine didn’t mention that having higher humidity would prevent your meringue from drying. So I baked for 2 hours as instructed and left in the oven (without opening it) for 5 hours. When I went to check it, it was still quite smooshy. So I turned the oven on for another hour. Smooshy. Another hour, smooshy. At that point it was getting too late in the evening to let it go much longer so I cranked the oven to nearly 500 for maybe 10 minutes, turned it off, went to bed and kept my fingers crossed I would have a crisp meringue in the morning. Thank goodness I did. I may have just given up on the whole dessert if I hadn’t. Once the meringue was secured, I worked on the curd. It was my first curd making experience so I wasn’t sure what to expect. It was really quick. You definitely need to keep your eye on it, because before I knew it, it was nearly boiling. I almost went really lazy again and wasn’t planning to strain the finished curd, but at the last minute I did. And I’m glad. There was a ton of zest that came out and some little eggs chunks as well. I’m pretty certain that wouldn’t have made any major impact on the dessert but at this point I’d been working on it for a full 24 hours so I wanted it to be good (and pretty). 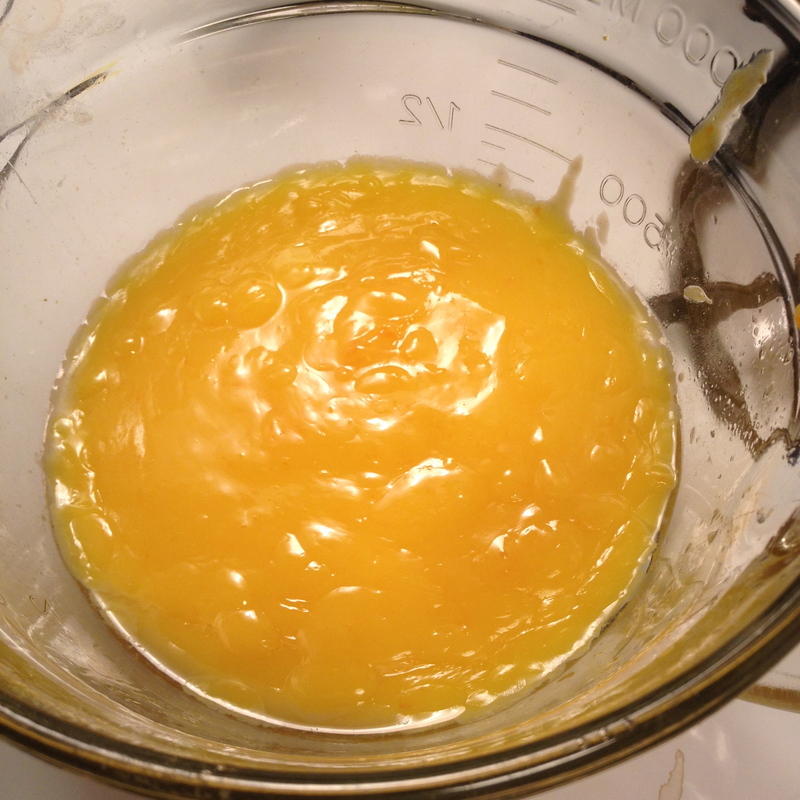 Orange curd might be even more delicious than lemon curd. And look at that color! So the final step was whipping some cream. I’ll spare you the details. 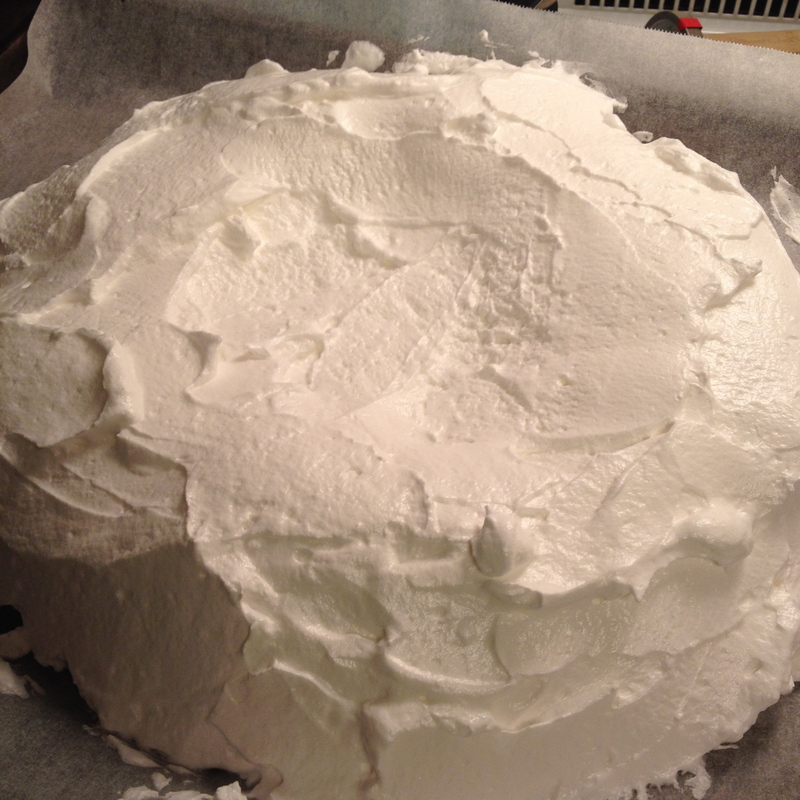 And then layering the meringue, then curd, then cream. Ta da!! The dessert that nearly killed me. Isn’t it beautiful?! Oh, what’s that? You want to know how it tasted? It tasted good. It tasted citrusy and light and New Yearsy. Did it taste so glorious that I didn’t mind all the effort and struggle of the meringue? No. Honestly, I didn’t love how hard it was to chew the meringue. It hurt my tongue a little bit. However, the combination of the orange curd and the whipped cream was a win. Next time I would skip the meringue and go straight to a store bought angel food cake. Now that would be heavenly. And finally, the Tangerine Cake. This was a fairly easy recipe to follow. It did, however, make me realize I need to upgrade to a Microplane. My rasp happens to be one that Everyday Food sent as a gift with subscription many many moons ago. For the most part it works just fine. Or it used to. It might be getting a little dull. Also, the skin on a tangerine is pretty thin and the combination of dull rasp and thin skin led to more pith in my cake than I hoped for. It did not effect the taste. Most of my glaze slid right off the cake and onto the plate. 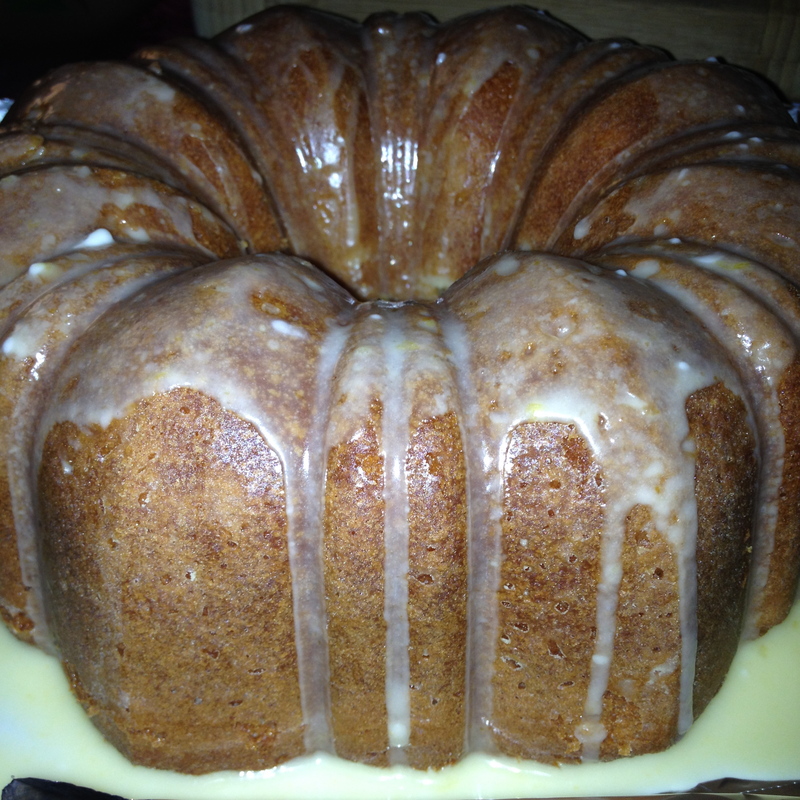 As a result, when serving the cake I scooped “extra” glaze onto each piece. So, the flavor. It was really orangey and good. It had a really nice texture. It was moist yet pleasingly dense at the same time. I sent the majority of the cake to work with the bear. It was a hit. I really need to make up some sort of business card that he can set next to the samples next time. After two different people asked him for the recipe, I asked him if he gave them the blog address… And he said not only “no”, but “no, I don’t know what your blog is called.” Sigh. If I was one to make cakes on a whim, I would keep this one in mind. As it stands, this blog keeps me busy enough with other sweets that I probably won’t return to this again soon. I hope you give it a try.